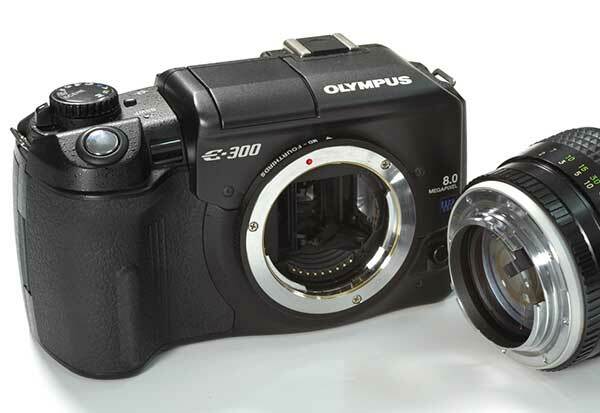 With the correct adaptor the Olympus E-300 will take all of your minolta lenses. Since Minolta changed to the AF mount in 1985 photographers that have invested in Minolta MF gear have been left largely unsupported by Minolta and third party manufacturers. One reason that Minolta MF users have not joined the world wide rush to digital is because no manufacturer, including the now defunct camera department of Minolta, supports the manual focus bayonet mount from Minolta on a digital body. Adaptors do exist for Minolta MF to Minolta AF mount but because the lens mount to film registration distance on a manual focus body (43.5mm) is shorter than that of a Minolta AF body (44.5mm) they must use an adaptor with optical elements inside to retain infinity focus. Minolta manufactured a dedicated 2x converter to enable use of manual focus lenses on its AF bodies, but naturally, if you wanted an unmagnified image you were out of luck. Some third-party manufacturers released converters with a lower level of magnification (1.1x to 1.3x), however these are generally of a simple one or two element design and resulted in a significant deterioration in image quality. The same problem exists with other major DSLR manufacturers including Canon (44.0mm), Nikon (46.5mm), Pentax (45.5mm) and Leica R (47.0mm). Unfortunately the impressive compactness of the original Minolta manual focus bodies had become our undoing in the switch to digital! One of the reasons for having a large focus registration distance is to provide room for the mirror inside to flip up out of the way when a photograph is taken. While some modern DSLRs have smaller mirrors (enabled by their smaller sensor size) they all are based upon existing camera platforms, and hence the registration distance remained the same - too large for use with Minolta manual focus lenses. Unlike the other manufacturers, Olympus had never followed up the successful OM series with an autofocus interchangeable-lens SLR. Accordingly, the company had no legacy system of lenses and bodies to work with, and hence when digital photography became the way of the future the company was able to completely reconsider the format. 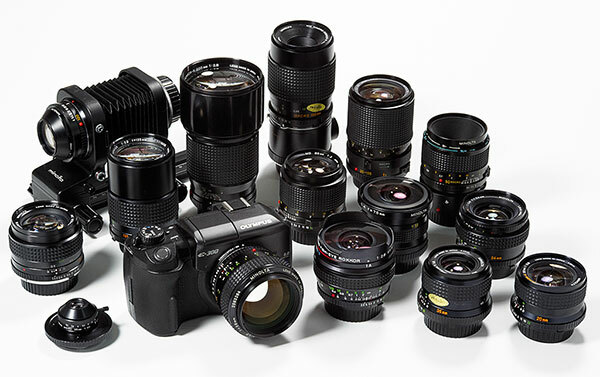 In response, in 2003 Olympus introduced the 4/3 digital system, a new open standard for digital SLR design, with common lens mounts that will enable lenses and and bodies of any 4/3 design to be used together, even if they are manufactured by different companies. The system uses a smaller sensor, enabling more compact camera bodies and the shortest sensor to lens mount registration for a digital camera with interchangeable lenses. Happily, at 38.67mm it is short enough to enable an adaptor to be manufactured that will allow a Minolta manual focus lens to be used on the camera. CameraQuest, operated by Stephen Gandy is a boutique camera importer and accessory manufactuerer based in the USA. many of you may be familiar with Stephen's site due to his profiles on many rare and highly sought-after cameras. Stephen has traditionally sold adaptors to enable the use of lenses from other manufacturers on different cameras, an area that even before the introduction of digital was a popular practice for some professionals, seeking for example to achieve the results from a Zeiss wide angle on their Canon autofocus body. With the introduction of the Olympus 4/3 format it was possible to open this up to many more camera brands, and he is now providing adaptors for most interchangeable lenses, including Minolta manual focus. The CameraQuest MD-Fourthirds adaptor is mounted and left on the camera, and thereafter every Minolta lens can be mounted and dismounted. The process requires the use of an allen key to loosen a small grub screw, and while this is less than perfect it is much less expensive than buying more adaptors! The adaptor isn't inexpensive at US$175, however this price is to be expected for a custom designed and manufactured item with limited market. Importantly, it enables Miolta manual focus users with a desire to continue using their lenses to experience the full resolution and speed of these lenses without any loss in performance. Olympus have 4 digital 4/3rds camera bodies, the E-1, E-300, E-500 and the new E-330 (the first ever dslr with live preview and movie capture capabilities). The E-1 was the first fourthirds system camera to be released in June 2003, and it was followed by the E-300 in Septemeber 04, the E-500 in September 2005, and the E-330 in January 2006. 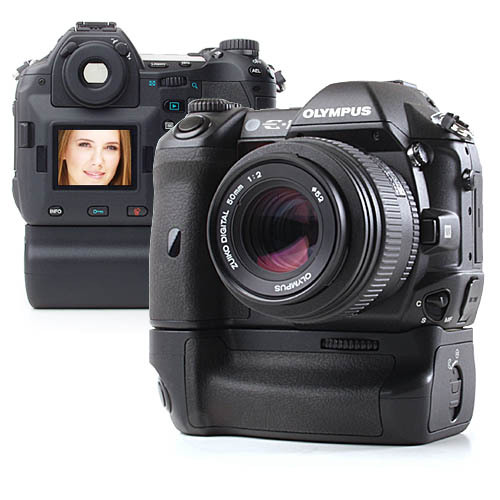 The Olympus digital bodies are all priced between US$599 and US$999 at B&H Photo, making them very attractive alternatives to the higher priced DSLRs from other manufacturers. On ebay prices are even better, with the E-300 available for under US$400 new, and the E-1 available for approximately US$450. Unfortunately the E-300 and E-330 have slightly modified light chambers due to the unique prism that allows the viewfinder to be positioned to the side of the camera rather than the typical slr position. This modification means that the aperture pin of the Minolta lenses will foul on areas of the light box. All other E series cameras are reported to work well (but we have not confirmed this). 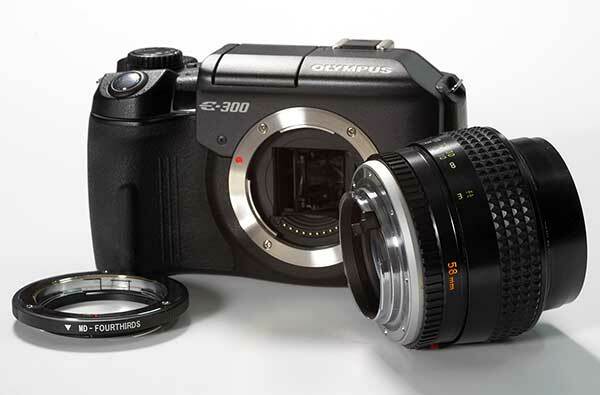 There are two options for the E-300 owner that wants to use an adaptor for MF Minolta lenses. 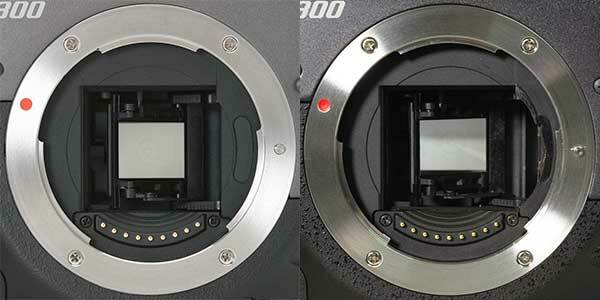 Either shave a mere 0.3mm off the lens aperture pin or modify the light box on the E-300. The modification to the E-300 light box requires some skill with a knife and is not one I recommend for the faint of heart. As can be seen a large piece of plastic needs to be removed from the light chamber. Care must be taken as this also holds the spring that retains the viewfinder focus screen. A channel may be cut in the plastic with a dremel tool rather than the total cutaway approach chosen here and it may even be possible to use a fine tipped soldering iron to melt away a section of the plastic. On the next page we explore the use of the Olympus system with your Minolta lenses, including first hand experiences and some images captured with the camera. This site is copyright Chasing Summer Photography. Any use of text or images from this site without consent is prohibited.